Difference between revisions of "Gerrit"
Note: By default the password field is blank, be sure to generate a password using the "Generate Password" button. Gerrit is a web based code review system, facilitating online code reviews for projects using the Git version control system. For more information about Gerrit, please see http://code.google.com/p/gerrit/. I want project committers use Gerrit code review exclusively for my project. Everything must be reviewed -- no direct access to the main repo should be available. I want project committers to be able to bypass the Gerrit code review system and push changes directly to the git repo. Please note that this will have to be done via the 'new' Gerrit URLs(SSH and HTTPS). The original dev.eclipse.org SSH URLs will become inactive once Gerrit is enabled. Note: If you're adding all of your code repos to Gerrit, you will lose control of the 'container' for your project(/gitroot/projectname), as Webmaster will give the container to the Gerrit user. This means that you will not be able to create new repos via the initrepo command, instead you will have to contact Webmaster(via a bug). In order to contribute you need an Eclipse user account and agree to the Contributor License Agreement (CLA). If you are an Eclipse committer you already have one. To sign the CLA Log into the Eclipse projects forge (you will need to create an account with the Eclipse Foundation if you have not already done so); click on "Contributor License Agreement"; and Complete the form. Be sure to use the same email address when you register for the account that you intend to use on Git commit records. Logon to the Gerrit Web UI at https://git.eclipse.org/r/ using the email address you registered with your Eclipse (and Bugzilla) account and your Eclipse password. When accessing Gerrit over SSH from git or EGit use the username displayed here and upload your public SSH key to Gerrit here. Add one or more public SSH keys to Gerrit here. If you are absolutely certain you do not have keys already, you must create a public and private pair of SSH keys. It is strongly recommended that you use a passphrase. When accessing Gerrit over HTTPS from git or EGit use username and HTTP password displayed here Note: By default the password field is blank, be sure to generate a password using the "Generate Password" button. After someone pushed a change you can start reviewing the changes. Visit the Eclipse Gerrit Code Review instance to start reviewing. Use Gerrit queries to filter the review list for changes you are interested in. Register to watch projects if you want to be notified by email on new or updated changes pushed for review. Adjust your Gerrit preferences to customize it to your needs. See the Gerrit user guide for more information about using Gerrit. The EGit tutorial walks you through the basic steps of working with Gerrit and EGit. Eclipse will look for your private key in the SSH2 Home location specified in the General>Network Connections>SSH2 Preference Page. If your id_rsa private key makes use of the AES-128-CBC algorithm (view the file as text to confirm), Eclipse will need at least com.jcraft.jsch 0.1.44 to make use of it. 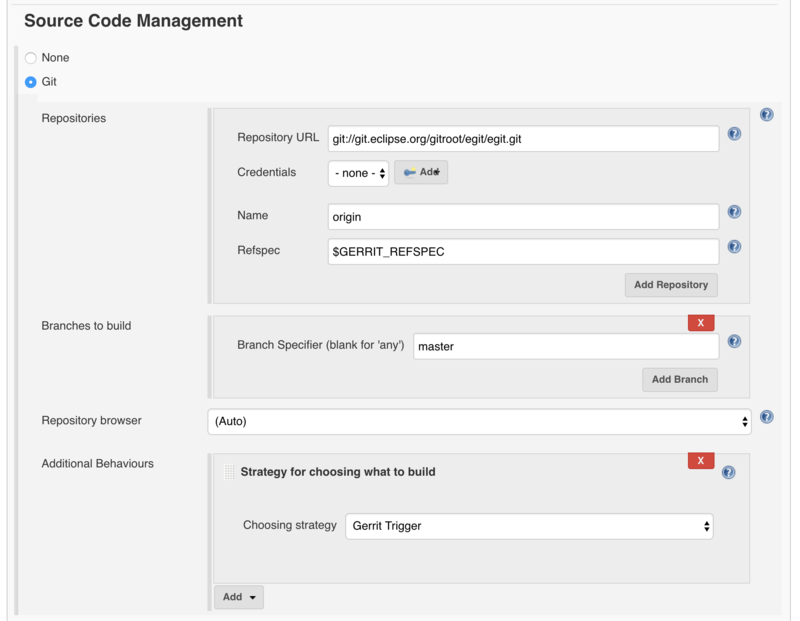 Afterwards open the Git Repositories view and select Gerrit Configuration... in the context menu of the remote "origin" in the Git Repositories view to configure pushing to the code review queue. From the appropriate Remotes node, create a New Remote and choose to Configure for Push. A unique name should be chosen, review is suggested. 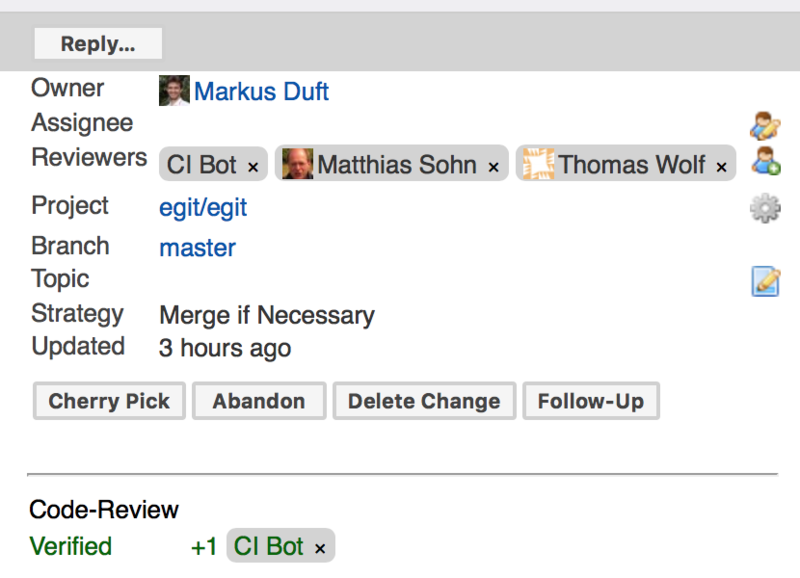 Changes committed to your local clone can now be pushed to Gerrit using the review Remote. You will be prompted for your private key's passphrase if Eclipse is looking for it in the right place. The Mylyn Gerrit Connector can be installed from the Mylyn p2 repository, e.g. for juno from http://download.eclipse.org/mylyn/releases/juno. The wizards "Import Projects from Git" and "Clone Git Repository" will offer the possibility to browse the list of repositories on Gerrit servers and to clone selected repositories. After cloning the Gerrit configuration will be done automatically. In some cases it may be desirable to bypass code review. Your Gerrit-enabled project must be configured to allow bypassing code review. Please ask Webmaster if you are not sure. Please see Denis' blog post outlining how to bypass code review. This will ask for a password. It is the password that you have to generate in the SSH Keys section of settings in your Gerrit account. The hook helps append a Change-Id to your commit message. EGit can also generate the Change-Id and can also be configured to automatically include it. This works because Gerrit links the new commit to the prior change based upon the Change-Id footer in the commit message. (This is automatically generated by the commit-msg hook you installed above.) If you refuse to use the commit-msg hook, or don't have a Change-Id footer, you should read the Gerrit documentation on change-id lines and replacing changes. Note: To be picked up by Gerrit, a Change-Id line must be in the bottom portion (last paragraph) of a commit message, and may be mixed together with the Signed-off-by, Acked-by, or other such footers. So if your Change-Id line is ignored it's probably not in the last paragraph :). Since each Gerrit review patchset actually commits its own tree, you can pull out the trees and compare them. If you're doing this from within an already checked out project, you can do git fetch origin (or any other remote name in .git/config}. Git fetched data will stay around in your repository, but will be 'orphaned' if no references point to it. To clean up, you can run git gc or wait until this happens automatically. Once you've pushed your commit to Gerrit for review, you can go to the web page (https://git.eclipse.org/r/) and see your changes. By clicking on the review, there's an option to add a reviewer by e-mail address; they'll then be sent a message indicating that they'd like your review on the item. The code review category indicates your opinion on the quality of the code, and how well it fits within the purpose of the existing surrounding code. A +2 vote from any committer is required before submission can occur. A -2 vote from any committer will block submission. Follow the rules given in Handling Git Contributions received via Gerrit. You may use the Jenkins Gerrit Trigger Plugin installed on sandbox Hudson in order to run a Hudson job to verify each new patchset uploaded to Gerrit for code review. Hudson will then also vote on these changes using the "Verify" voting category. In order to setup a verification build job file a bug in Bugzilla on "Eclipse Foundation > Community" using component "Hudson sandbox" and ask the webmaster to create a new build job on sandbox Hudson. Then configure the new job following the description given on the plugin's home page. The configuration sections for the Git plugin and the Gerrit trigger plugin of the verification job used by the JGit project may serve as an example. Under Source Code Management select Git. Click on Advanced and change the Choosing Strategy to Gerrit Trigger.